Online education and professional development opportunities for health professionals are available from Dementia Australia and other accredited providers as featured below. Develop your skills and grow professionally in the area of dementia risk reduction, diagnosis and management. 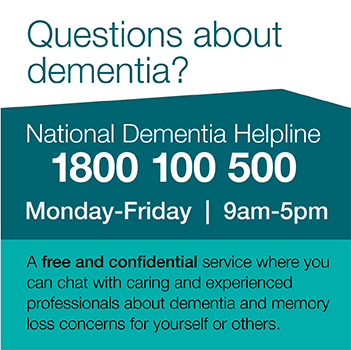 Dementia Training Australia DTA - offers a number of online training courses for GPs and Primary Healthcare Nurses including Recognising, Diagnosing and Managing Dementia in General Practice. Primary Health Networks - Please contact your local Primary Health Network – for training workshops and seminars. For more information visit the Health website. RACGP Learn Diagnostic Skills with the RACGP – The Timely Diagnosis of Dementia - Earn QI/CPD points from the RACGP by completing the Active Learning Module/e-learning module. Practice program which use current guidelines and provide resources and tools to improve diagnostic and treatment skills. RACGP Check Program - Access to commonly seen case studies on dementia for RACGP members via the RACGP Check Porgram. Please contact Detect Early if you are not a College member. ThinkGP – Think GP Provides ongoing QI/CPD education for general practitioners across Australia. Participate in integrated online and seminar based medical education. The Australian Primary Health Care Nurses Association (APNA) - APNA Online Learning delivers rich, interactive learning in a fully flexible online format, with courses designed specifically for nurses in primary health care and other health professionals. APNA, in conjunction with Dementia Australia Vic has developed the ‘Building a dementia practice in primary care’ (link to relevant section) online learning course for general practice nurses. Dementia Training Australia DTA - A consortium funded by the Australian Government to provide nationwide education on the support and care of people living with dementia. DTA offers a range of free online courses. Understanding Dementia - from the University of Tasmania, Understanding Dementia is a Massive Open Online Course (MOOC), offering university-quality education about the latest in dementia research and care. A free 9-week course. Education for pharmacists - The site offers tailored educational resources to assist with early intervention, as well as patient-focused materials in our Managing Dementia section.